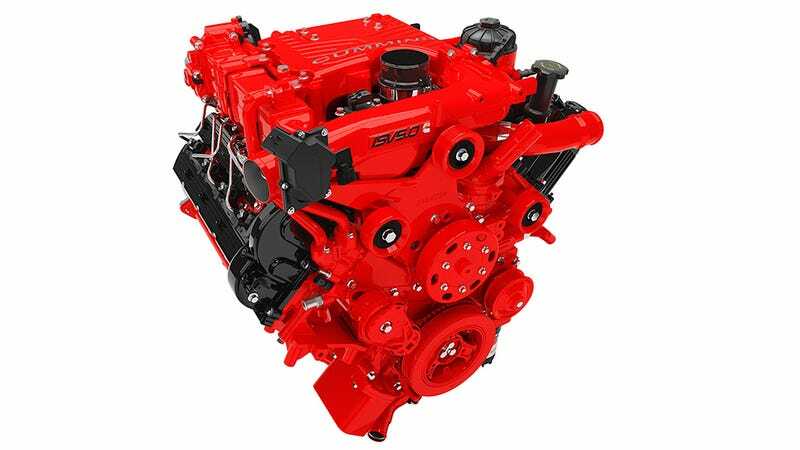 This is the ISV5.0 Cummins turbocharged V8 5.0-liter diesel engine, which will power the 2015 Nissan Titan (instead of the Dodge Ram as was planned). I hope they only come in red. Fiat's diesel engine maker VM Motori, is now the brand giving trucks and SUVs like the 2014 Jeep Cherokee 28 mpg, with the same 3.0-liter engine displacing the new Cummins from the Ram's engine bay due to better fuel economy. Therefore, Cummins needed a new home for their V8 an the new Titan juuuuust fit the bill. The ISV5.0 was designed to fit in any engine bay with a V10 or a V8 of similar performance, and features a compacted graphite iron cylinder block, forged steel crankshaft, high-strength aluminum alloy heads and composite valve covers with a dual overhead camshaft design. It puts out anything from 200 to 275 horsepower with a peak torque of 560 lb-ft.
That's all very nice, but what would you put it into? A diesel land yacht? A classic Soviet tank? The 2015 Nissan Titan? You tell me!